HOT-SHOT Richard Gregory has signed a contract with Bromsgrove Sporting ahead of the upcoming season. The former Leamington and Stratford Town front-man joined from Stafford Rangers in December last year and scored 30 goals in 27 appearances in all competitions. His partnership with Jason Cowley, who finished as the Midland League Premier Division’s top scorer with 28 goals, help guide the Rouslers to back-to-back titles and promotions. “I’m very happy to sign a contract with Sporting,” said Gregory. “From the moment I came here I loved the place, the fan base is brilliant and, most importantly, I started enjoying playing my football again. “I have a very good relationship with Brendan on and off the pitch I like the things we’re doing here and want to be a big part of this club over the next couple of years. Manager Bren Kelly added: “I’m very pleased to secure Rich’s services for the coming season. “To be successful and win leagues you must have a goalscorer and Rich is definitely a goalscorer. “He’s has had interest for several clubs but he likes what we are doing here and his playing with a smile on his face. 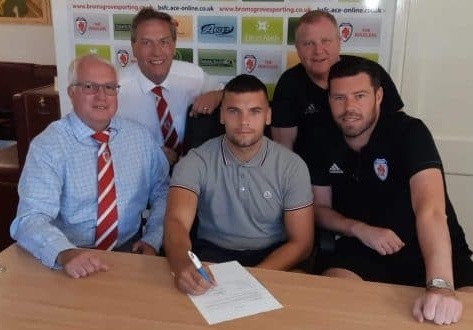 “The contract is a sign of how focused he is on achieving things with Bromsgrove Sporting. “It will nullify any distractions for both Rich and the club as we enter another season where we will not want to stand still.